With the cool autumn days and even cooler nights in force here in northern Indiana, it became apparent that the dozens of green tomatoes left on the vine weren't going to ripen. 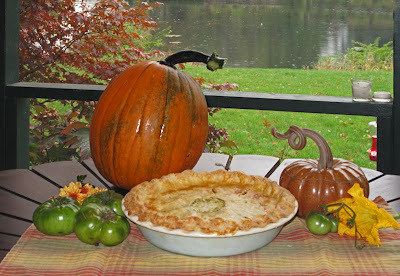 While this might cause some folks sadness, I was thrilled because I could use them to make one of my favorite fall foods, green tomato pie. I learned about this pie a few years ago when one of my employees came in on Monday and related that she had spent the weekend with her grandmother canning and making pies. Being a lover of all pies, I inquired what kind of pies they made and green tomato was one that she mentioned. When I told her that I had never even heard of a green tomato pie, she told me it was a traditional Mennonite recipe and she would bring me one the next day. I wasn't sure what to expect but I absolutely loved it! I asked her for the recipe and now I make it regularly. Here is her grandmother's recipe. The woman who worked for me's last name was Good and she called her grandmother Grandma Good so I call this Grandma Good's recipe. Make crust and refrigerate for at least one hour. Preheat oven to 425 degrees F. Meanwhile, prepare the ingredients and combine (I used the 1/3 cup white and brown sugar and molasses combination). Roll out bottom crust and fit in a greased and floured pie pan. Add filling and top with a top crust. Flute edges, brush on an egg wash, and bake for 10 minutes at 425. Reduce heat to 350 degrees F and bake for 35-40 minutes more until crust is golden brown. I also made a small pie without using any apples, just substituted more green tomatoes for the apples and it was just as good. Hey Emily! Love your blog! Also, love that your dad blogs too. This recipe looks really interesting. The only way I've heard of using green tomatoes is fried or pickled! hi tanvi! i love your blog too! i do love both pickled and fried tomatoes. also wondering if you might have a good recipe for a lemon pickle?? The green tomato pie is great with a dollop of whipped cream or even better, a scoop of vanilla ice cream on top.